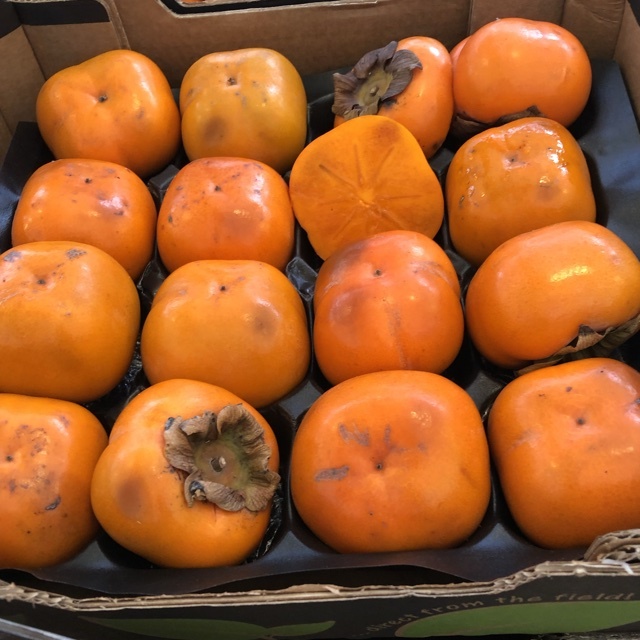 Sharon fruit is the trade name for a variety of persimmon whose astringency has been artificially removed, so it can be eaten at all stages of maturity. They have a similar plump shape of a tomato, averaging 5-8 centimeters in diameter, topped with a green or brown calyx. Their thin, waxy, edible skin is pale to reddish-orange in color when ripe, and the orange flesh is almost always seedless, has no core, and is void of any bitterness. It offers a sweet flavor, even if it is still immature and firm, with a crisp and succulent texture. As the fruit matures, it softens to a custard-like consistency, developing a more complex sweet flavor with hints of brown sugar. Sharon fruits are available in the fall and winter months. Sharon fruit is botanically classified as Diospyros kaki, a Japanese persimmon, and is a member of the ebony wood family. 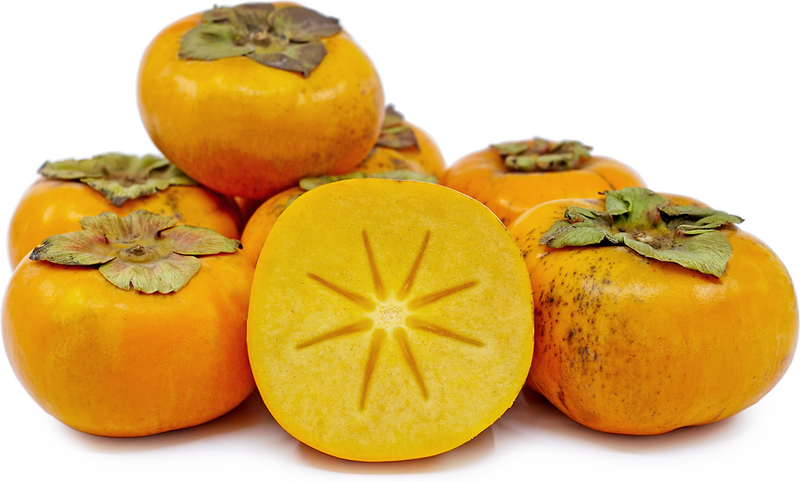 It may be called by several other names, including Korean Mango and Triumph, which is actually an astringent persimmon variety that is sold as Sharon fruit once astringency is chemically removed. Sharon fruit is picked and treated through Modified Atmosphere Packaging, or MAP for short. The fruit is stored in a low-oxygen high-carbon dioxide environment for 24 hours to facilitate natural ripening and remove its astringency. This controlled atmospheric storage is not a new method however; evidence suggests that harvested crops have been stored in controlled environments since the Egyptian period. Sharon fruits have high fiber content, containing roughly twice as much fiber as an apple, and they are rich in minerals, such as sodium, magnesium, calcium and iron. They are widely regarded for their high level of beta-carotene, found in both the skin and flesh, making them a great source of vitamins A and C. They are also high in glucose and protein. Sharon fruit can be eaten fresh, used in sweet or savory cooked applications, as well as preserved in both dried and canned form. It can be eaten whole at any stage of ripeness, though as it over-ripens the flesh may become translucent, but is still edible. Add fresh Sharon fruit to salads, roast and serve with a mascarpone cream, or use in recipes for baked goods. Sharon fruit can be made into sauces, jams, chutneys, marinades, and puddings, where it is often paired with spices like cinnamon, ginger, nutmeg, allspice, and cloves. Sharon fruit complements grilled shellfish and pork, and also pairs well with endive, coriander, squash, figs, pears, olive oil, softer cheeses like taleggio and goat cheese, or aged cheeses such as manchego and parmesan. As far as preserving, the fruit can be peeled and dried whole, or cut into slices with or without the peel before drying. Under-ripe Sharon fruit will continue to soften at room temperature, and will take about one week to ripen. To accelerate the process, store at room temperature next to bananas or apples. Ripe Sharon fruit will keep in the refrigerator for about three days. Sharon fruit takes its name from the Sharon plain, the valley of the river in Israel where the fruit was developed, and is still widely grown today. Sharon fruit is native to Israel, where it has only been in cultivation since sometime in the 1900s. 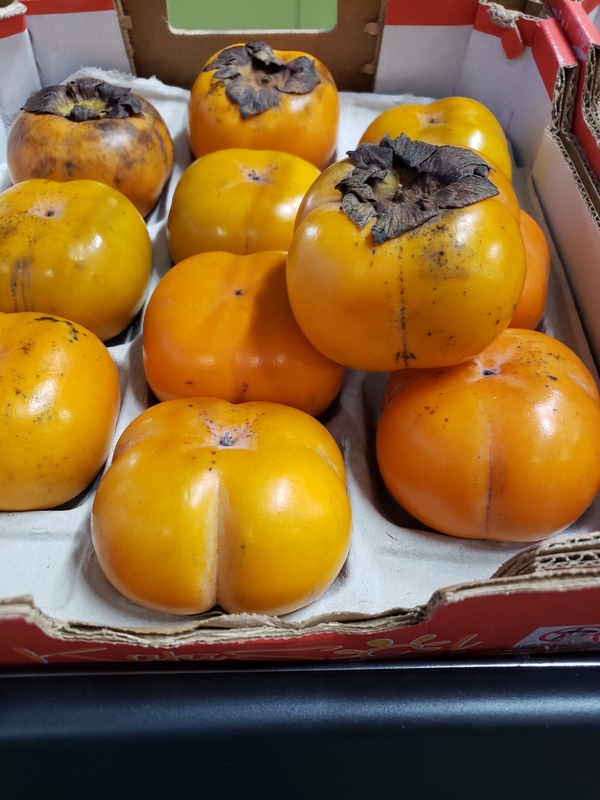 Looking back a little further at the Sharon fruit’s parentage, Japanese persimmons in general are native to China, where they have been cultivated since around 1000 BCE. Japanese persimmons spread quickly from China into Japan and Korea, where many cultivars have since been developed over the centuries. They were introduced into Europe sometime in the 1600s, and into the United States in the mid 1800s, though the first documented picture of a mature Sharon fruit in America came much later, in 1913. Today, Sharon fruit are grown primarily in Israel, Spain, and South Africa, with a small scale in California and the Gulf states, mainly in home gardens. Recipes that include Sharon Fruit. One is easiest, three is harder. People have shared Sharon Fruit using the Specialty Produce app for iPhone and Android. Sharer's comments : Sharon Fruit spotted at Lindengracht Markt. Sharer's comments : Sharon Fruit spotted at Jungle Jims in Cincinatti. March 2018.